Well I must be on a roll and Nova from 'A cuppa and a catch-up' suggested I should buy a lottery ticket. Perhaps not as it might be a bad omen. I just stick to giveaways and charity raffles. So what did I win ? Well I won Nova's most gorgeous Celebrate Seuss wall hanging that can be seen here. And this is just perfect as I have the most adorable 2 1/2 year old nephew in Germany to whom I will sent this straight away. 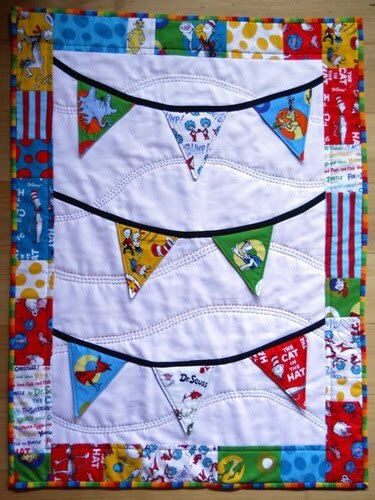 Not sure now what to do with all the 'Celebrate Seuss' fabric I ordered last week..................a quilt perhaps, tables sets, cushions ? I am sure I find something to do with it. The 'Mod Aqua II' quilt is finished and I will post some images tomorrow as I have to wait for daylight or at least for daylight hours when I am at home......Winter is not my favourite time of the year. But on the plus side is that we have next week the shortest day already so it can only get better. I also will have pictures of yet more goodies that arrived last week via my posti on my doorstep. The good man find all sorts of ways and means to leave the packages if they don't fit through the letterbox anymore .